Shop with BROOD for basset and BROOD-themed merchandise and you'll be helping homeless hounds at the same time. We offer many different shopping alternatives for you to choose from. BROOD Store We have lots of amazing basset gift items for both people and hounds in our Online Store. Check it out today! BROOD's Zazzle Store BROOD now has a Zazzle store where we have hundreds of unique products designed just for YOU! EXCLUSIVE HOME FOR BROOD RAMBLEWEAR!! Plus 100% of all profits go to help BROOD's homeless hounds! Shop at Amazon.com Sign up with Amazon Smile and select BROOD as your charity. You'll not only get great products and service, but a portion of your shopping dollars will be donated back to BROOD! Subscribe to Animal Wellness Magazine Subscribe to Animal Wellness Magazine, North America's largest natural pet health magazine. User promo code BROOD and we receive 25% of proceeds from subscriptions and sales. Shop with iGive.com Shop at over 700 online stores and have a portion of your shopping dollars go to BROOD. 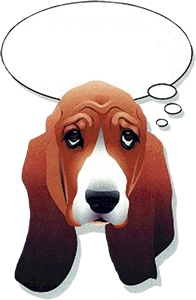 Just click on the link at left to go to igive.com and pick Basset Rescue Of Old Dominion as your charity - then register for a userid and start shopping! Shop at La Croix Tees BROOD has a custom site with LeCroix tees featuring the BROOD logo design, as well as great selection of fun tee shirts, hooded sweatshirts, tank tops and more. Shop through our designated BROOD link and BROOD will earn $8 for each t-shirt purchased, $2 for magnets and $1 for bumper stickers and silicone bracelets. The Chocolate Lab Shop for a cause! When you make a purchase of delicious human or dog treats from The Chocolate Lab, please select BROOD at check out. That way BROOD will receive 20% of the sale as a donation from you and The Chocolate Lab! Chewy.com Chewy.com has a huge selection of pet food, treats and supplies all delivered right to your door with 20% off and free shipping. BROOD will receive $20 for each new customer referral who completes an online order. Artful Hounds Artist Renee Bane is nationally recognized for whimsical basset creations. All Artful Hounds items are handmade with skill and care, in the hope that the designs will bring happiness and joy to your heart and a smile to your face. Plus if you specify BROOD during check out, Renee will donate 10% of your purchase back to BROOD. 1-800-PetMeds is America's largest pet pharmacy. They deliver prescription and non-prescription pet medications along with health and nutritional supplements at substantial savings, direct to the consumer. Shop using this link and they will donate a nice percentage of the sale to BROOD. K9 Belly Bands K9 Belly Bands are for male dogs who are having trouble with incontinence or need help with house training. Each band is hand made and come in a variety of sizes, colors and designs. When you shop using this link and select BROOD during checkout, BROOD will get 30% of the net proceeds of your order. PetsMart PetsMart is the nation's largest pet supply retailer, offering over 12,000 competitively-priced products. When you use BROOD's special link, PetSmart will donate part of your purchase back automatically. Happy Tails Books "Lost Souls: Found" has over 60 stories from people who have fostered and adopted basset hounds. Go to the Happy Tails Website and be sure to specify BROOD as your rescue group.